Given how long surfers have been trying to explain the spiritual and transformative powers of riding waves, it is downright shocking that Jaimal Yogis’s book, Saltwater Buddha, is the first of its kind. The personal narrative of the young author’s coming-of-age love affair with surfing and his ever-evolving relationship to Buddhism makes for a quick, entertaining read of tube-minded self-help. 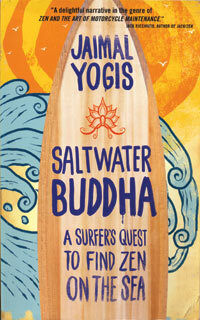 Think Dan Millman’s Way of the Peaceful Warrior but with a wetsuit and a Buddhist bend. But it isn’t just a crash course in the basic-and sometimes not-so-basic-tenants of Buddhism through the filter of a real surfing life. By synching the development of his relationship to these two separate though often intertwined pursuits, Yogis, thanks in large part to his breezy yet markedly descriptive writing style, peels back the layers on the often cloudy-teenager/young-adult mindset in a uniquely rewarding and accessible way. And, as a result, the book winds up being a treat for surfers and non-surfers alike. The occasional brilliant and original descriptions of the simple act of surfing peppered throughout the 235-page book become a bonus prize for readers who share Yogis’s love of riding waves. 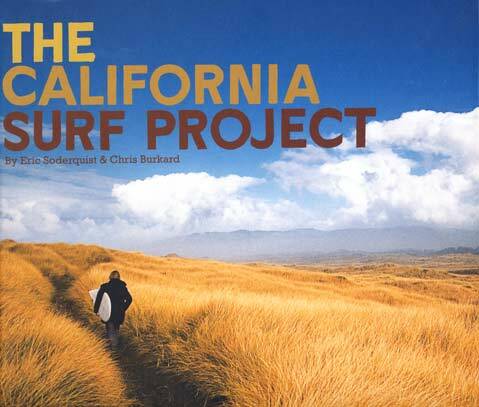 For anyone jaded on the constipated, rail-bumping realities of being a surfer south of Point Conception, go get yourself Chris Burkard’s new book, The California Surf Project. Early last winter, thanks to an award he won from the folks at the Follow the Light Foundation, the Arroyo Grande-based photographer went on a good, old-fashioned surf-motivated road trip with fellow Central Coaster and professional surfer Eric Soderquist. In a cranky but effective 1978 VW bus, the duo made their way along the length of the California coastline, starting at the Oregon border in early November and arriving at the walls and barbed wire of Mexico’s several weeks later. Breaking down, growing beards, getting barreled, and being reminded on a daily basis just how vast, divergent, and supremely sublime the Golden State can be, the young adventurers live a life that is a salt-water soaked version of Kerouac’s On the Road. Like California itself, the images vary from the rudimentary and bland to the undeniably perfect-the spectrum an honest and truly enjoyable ode to all that is California. Better yet, as you turn the pages of The California Surf Project, you cannot help but feel refreshed. The images of dark, ominous, and empty NorCal point breaks giving way to sun-soaked broken-down barns, paved-over urban landscapes, and dreamy, back-lit peelers work in unison to fire up the stoke furnace and urge you to explore your own backyard with a renewed sense of wonder. Make no mistake about it-this movie is f-ing beautiful. But it also must be said that it is quite possibly the most nauseating form to date of overly dramatic naval gazing from an industry that specializes in egos and putting people on self-important pedestals. Shot on location in Indonesia, the film is a bio pic of sorts, chronicling everyone’s favorite ripping goofy-foot with an afro, Rob Machado, as he embarks on an impromptu soul-searching adventure via motorcycle, boat, foot, and the occasional hitchhiked ride. It seems Machado, after years of being a well-paid professional athlete who gets to travel the world on his sponsor’s dime and have the ocean as his office, has become disillusioned with the lifestyle. Super melancholy moods, angsty ramblings reminiscent of a Holden Caulfield in board shorts, and images of Machado in crucified poses are commonplace as the film progresses and Machado goes looking for redemption beyond the bustle of Bali. The juxtaposition of this film’s version of Machado with the carefully crafted image of him as a kicked-back, easygoing Zen master portrayed by surf media for the better part of the past two decades is remarkable. The film reeks of an underlying personal situation; it never mentions what it is, but even the most thick-headed viewer has to wonder. That is to say, if this movie-with its long, color-saturated shots and sparse yet heady narration allegedly ripped from the pages of Machado’s own journal-is an exercise in metamorphic honesty, then where is the big reveal? Why is the man they call Mob so bummed? Criticism aside, the movie is good, real good. The surfing footage is stunning and proves that Machado, despite being off the world tour for a number of years, is still near the top of the high-performance totem. His tube riding continues to be the second coming of Gerry Lopez, his lines drawn innately to the most critical parts of the wave. The stuff from Uluwatu is particularly impressive; watching it is like a form of meditation, thanks to the genius efforts of Director of Photography Todd Heater. Further, the landscapes, lineups, and people of Indonesia are, in many ways, the real stars of the film. While Machado hits the road, grizzled with the idea of flying back to California, he decides to extend his trip and ultimately winds up helping a village build a fresh-water well while camping alone near the sea, with the spiritual and exotic wonders of Indonesia splayed full force across the screen. The tribute to this magical place not only adds a much needed dose of the real to Machado’s presumably self-imposed loathing but it eventually rescues the man himself, delivered by the film’s end back to the happy spot of groovy bliss that we, as surf media junkies, have always known him to be.